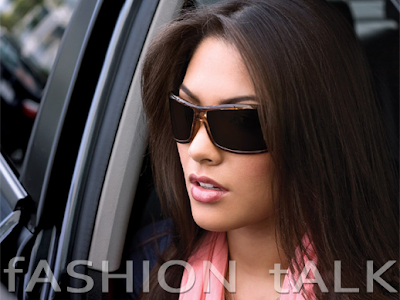 1) One of the newest trends of sunglasses this season is Ray-Ban's Wayfarers. This fashion of sunglasses was particularly popular in 1950's and 1960's. This year thay made a major came back. Such sunglasses come in classic black, vintage dazzling colors or new two - toned frame choices which create the decisive classic style. 2) The 70's style thicker frames have been admired for a few years already. However, you should be very cautious if you decide to choose these retro styles - enthused protections of sun. They should be suitable for your face features and not to look too big. 3) Tortoise shell glasses are all still very hot this year. Stylists think that they will most likely go out of style soon, but this year they are still smart. They are universal because they can be worn with any style of clothes. A good asset for a difficult financial times! 4) One of the latest trends in sunglasses are the gradient lens. These sunglasses give emphasis to lenses, which are usually half shaded from top to bottom, and not frames. Different color lenses will make you to look fresh and very stylish. 5) The round "John Lennon" style sunglasses were mostly favored by hipies. Later they were associated with such celebrities as Philip Johnson, Le Corbusier, Dominick Dunne or Gandhi. These sunglasses helped to create unique and clear style. This year "John Lennon" style sunglasses made a huge come back especially for women. So, if you want to attract lots of minds, these unusually looking sunglasses are a perfect choice for you!